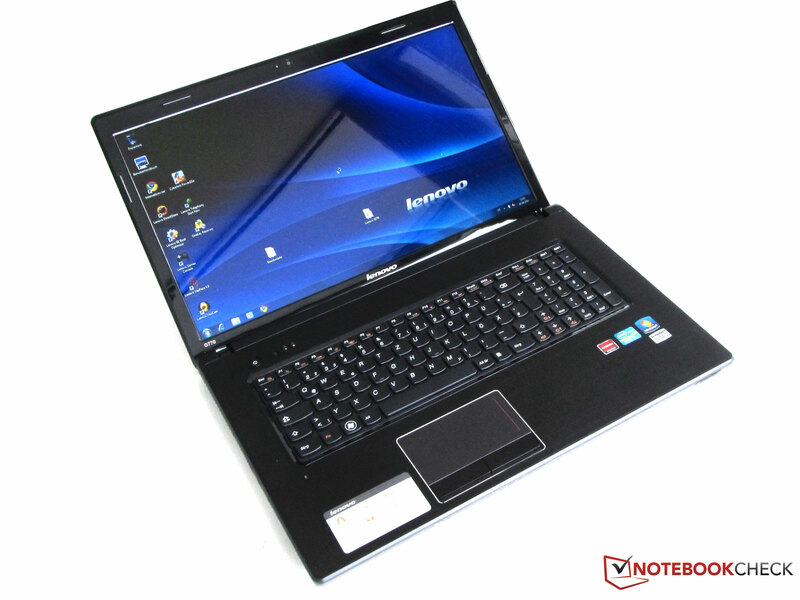 The G770 models from the Essential series have been enhanced with Enhanced Experience for Windows 7 by Lenovo, which reduces the booting up and shutting down of the operating system by up to 66 percent. In addition the starting of applications is also supposed to be twice as fast as a result of this feature. Lenovo has integrated a Core i7 CPU from Intel into the G770 notebook (model M533AGE), which also includes one of the two graphics options. Along with the integrated HD Graphics 3000, there is also a dedicated AMD Radeon graphics card included, which is equipped with 1024 MBytes of memory. The basic clock speed of the dual-core CPU from Intel lies at 2.7 GHz, and can be increased to 3.4 GHz by using the Turbo mode. 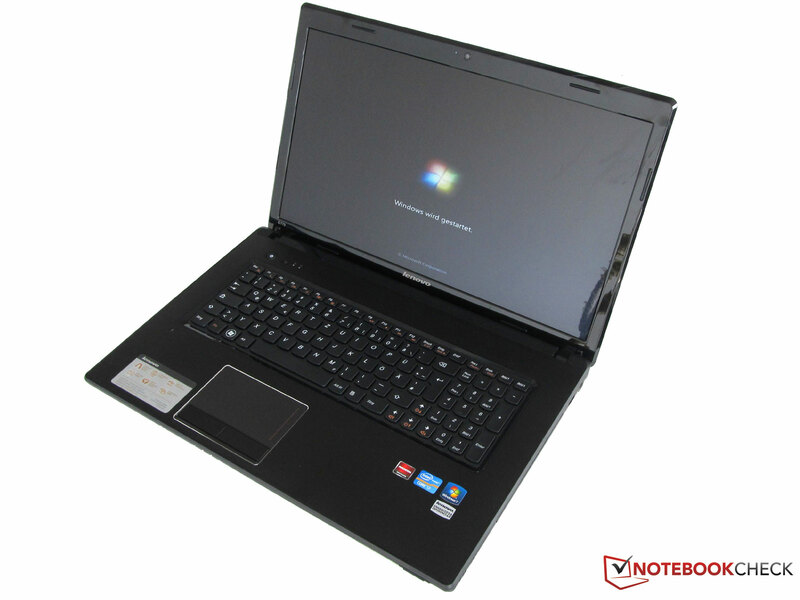 The G770 M533AGE has a 17.3 inch display which can present a resolution of 1600x900 pixels. Further to this there are also 8 GBytes of RAM, a 2.5 inch hard drive with 750 GBytes of storage capacity, and an x8 DVD burner included. 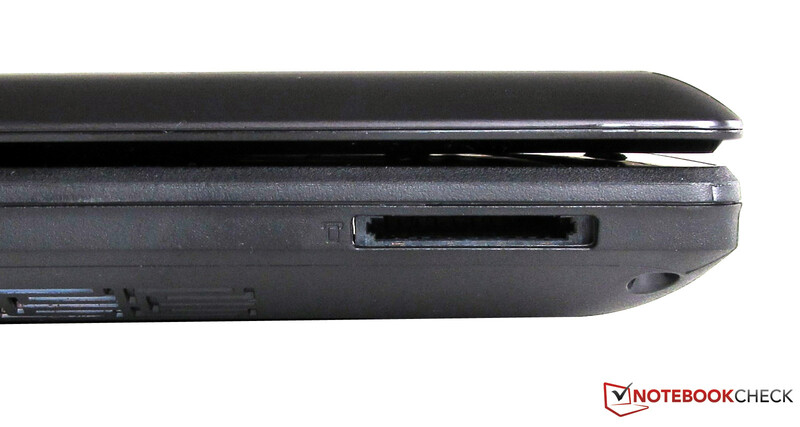 As standard the Lenovo G770 M533AGE only has 4 GBytes of RAM included however: The current offer from Cyberport also provides an additional 4 GByte RAM module and a fitting notebook bag though. 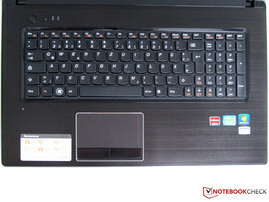 With this configuration the G770 M533AGE from Lenovo should come at a price of around 799 Euros (including VAT). With respect to the appearance Lenovo has opted for a spoiler-type styling with a star pattern. The surface is definitely stunning, and appeals with its brushed metal look. 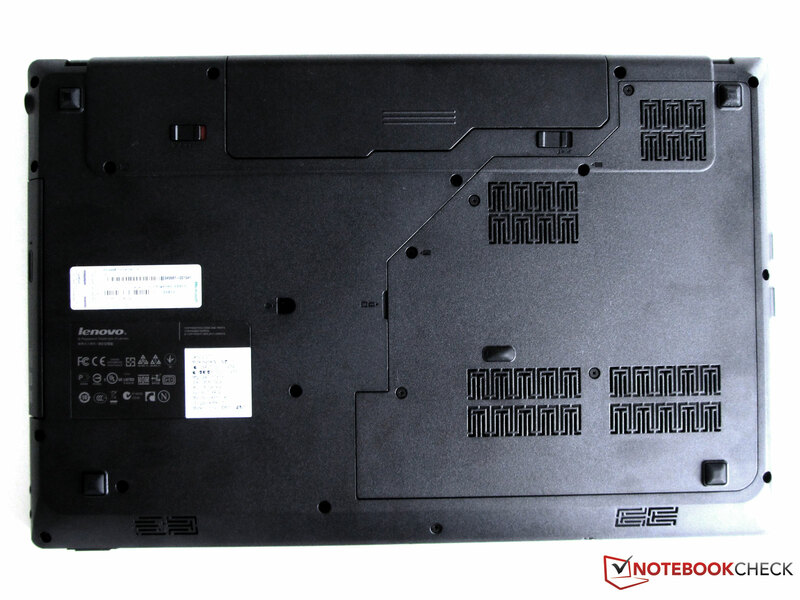 The case is almost identical with the one used for the Lenovo G575 model (15.6 inch). The surfaces of the notebook unfortunately attract dust in a magical way, and fingerprints quickly leave their mark as well. 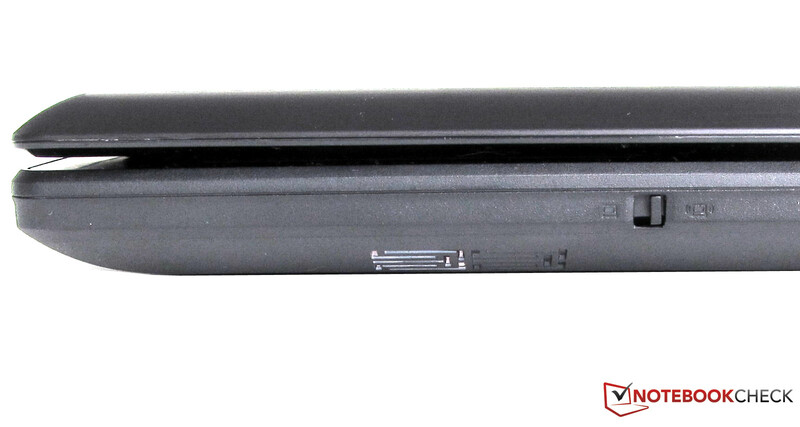 The Lenovo marketing slogan "The notebooks can be opened easily with one hand" couldn't be confirmed by us, since the base unit also moves upwards when trying to lift the lid. Once opened, the palm resting area made of brushed metal, and the AccuType keyboard with a separate numeric keypad reveal themselves. The display frame of the 17.3 inch display can be bent easily, and can also be dented inwards from behind. The two hinges also don't give a reliable impression. During the review we kept getting the feeling that these would break off at any moment when the display was opened as far as possible (~130 degrees maximum opening angle). This wasn't the case however, but we nevertheless have a different idea of what good stability is. The stability of the base unit is significantly better, and nothing can be bent or broken. 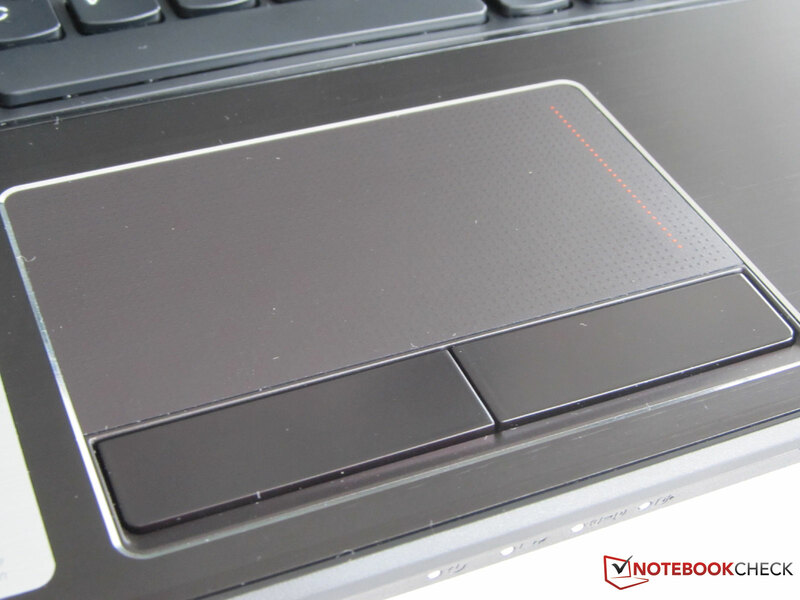 The palm resting area, as well as the keyboard and touchpad, are very firm and are integrated into an aluminum plate. 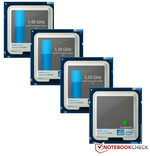 The appearance reminds us of the Dell Vostro 3555 reviewed by Notebookcheck a short time ago. The similarity is intriguing, and it seems as though Lenovo has merely omitted the chrome edges. 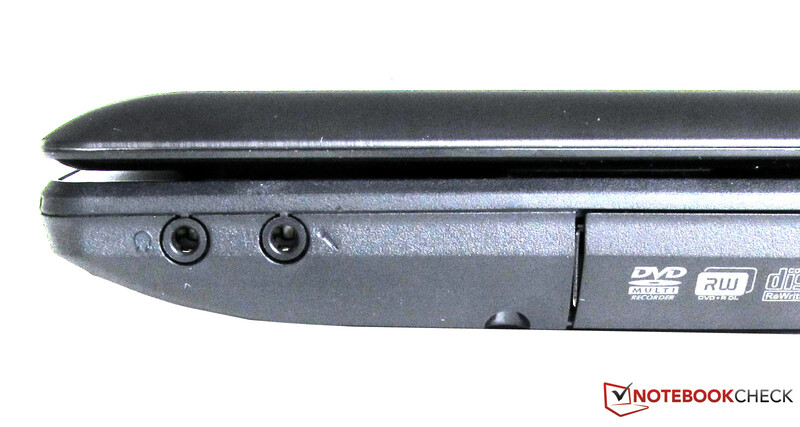 The Lenovo G770 weighs a whole 3 kg including the 6 cell battery. While the AC adapter weight comes to a total of 480 grams. The dimensions of the notebooks extend to 416x45x272 mm. The number of ports and interfaces is limited to a minimum. Along with four USB ports, one of which supports USB 3.0, we were only able to find one VGA interface, one HMDI port, two audio sockets (1x headphones, 1x microphone), and one RJ45 port. The latter of which is also only Fast Ethernet compatible. That's it as far as interfaces go: No eSATA, no ExpressCard, and no DisplayPort connection. The optical drive is located on the right side, in this case an integrated DVD burner. 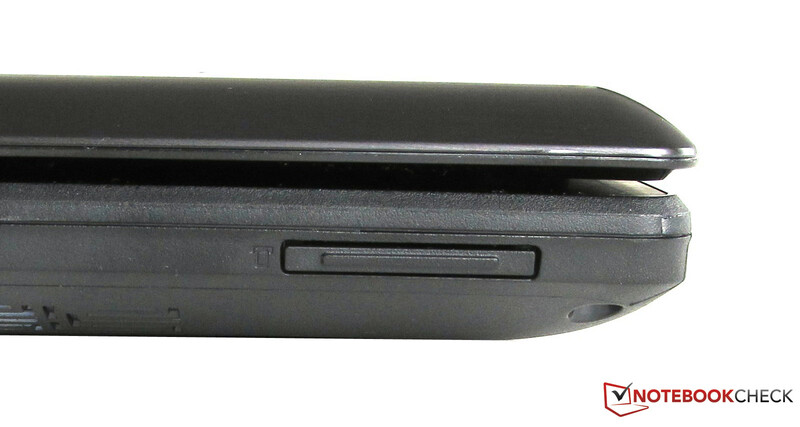 A 5-in-1 card reader is provided at the front on the right side of the notebook, and is protected by a dummy card. 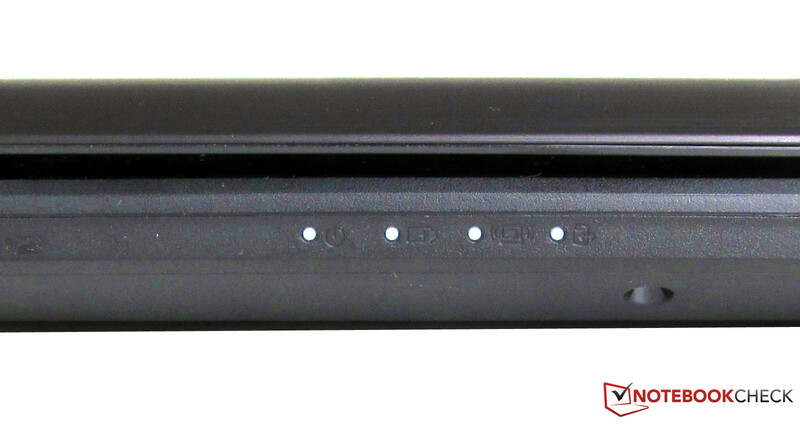 The location of the ports is only partially satisfactory, with three of the four USB ports located on the left at the front, whereby the distance between them is relatively small. If using wide USB connectors this could quickly lead to problems. 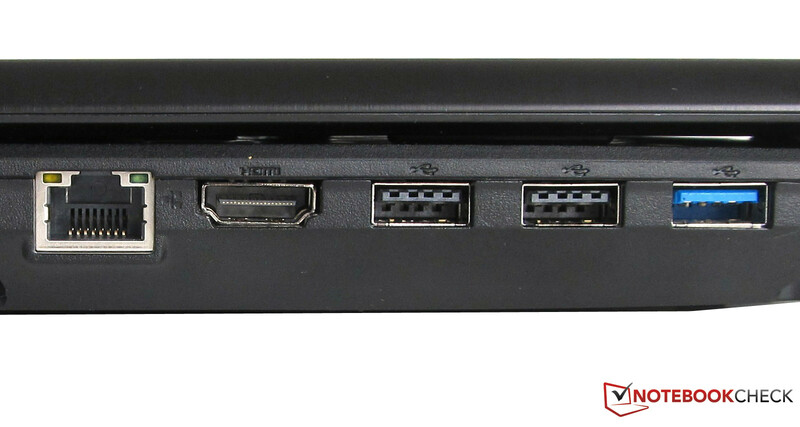 What came to our attention with all four of the USB ports, is that they were difficult to use. The USB connectors for our test equipment (USB mouse adapter, USB sticks, and hard drive) were difficult to plug in initially. 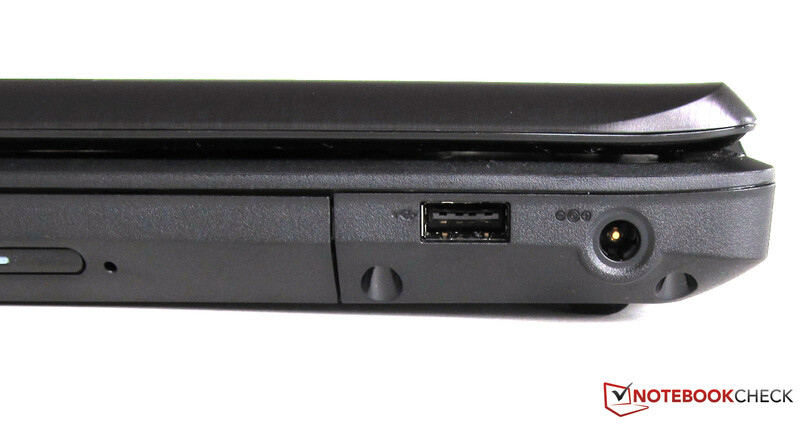 The back of the notebook has been spared any interfaces or ports, and there is also no connector for a docking station under the notebook. 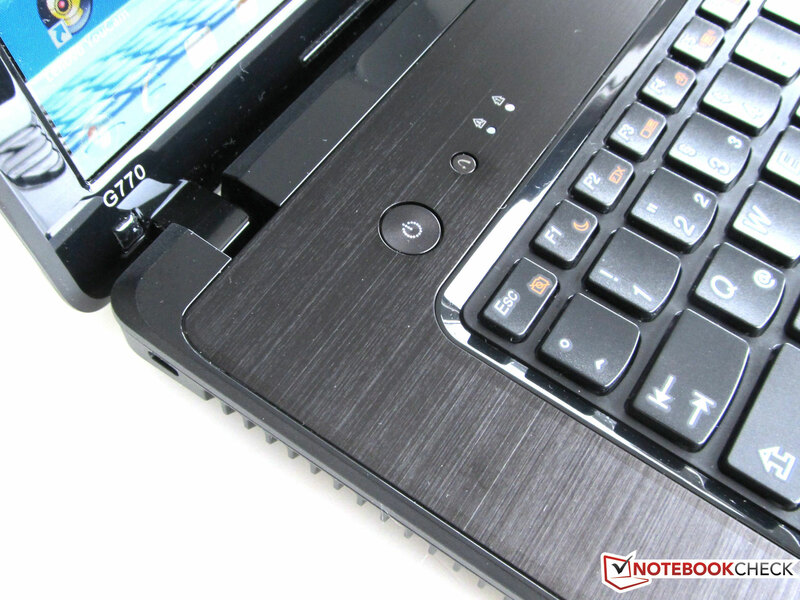 The Lenovo G770 provides multiple possibilities for connecting to a work or home network, and hence also the internet. On the one hand there is a Fast Ethernet port (10/100 compatible) available as a hard wired option, while on the other the integrated wireless LAN provides for communications using the IEEE standards 802.11b/g/n. Bluetooth is also included. Among the security features are the security lock (Kensington Lock) and facial recognition software (VeriFace). The logging in of registered users takes place with VeriFace without entering a password. By using the integrated webcam to scan and verify the users face, and grant access if recognized (hopefully). Unfortunately the G770 doesn't have a fingerprint reader. Besides the notebook and the AC adapter, there is nothing additional included with the delivery. Numerous software and manuals are either contained on the hard drive, or can be found on the internet. The recovery files for the operating system including all the drivers can be created with the application 'OneKey Recovery 7.0'. We were not able to find any special accessories for the G770 in the online shop. Merely mice, batteries, and bags (for all models) are provided. 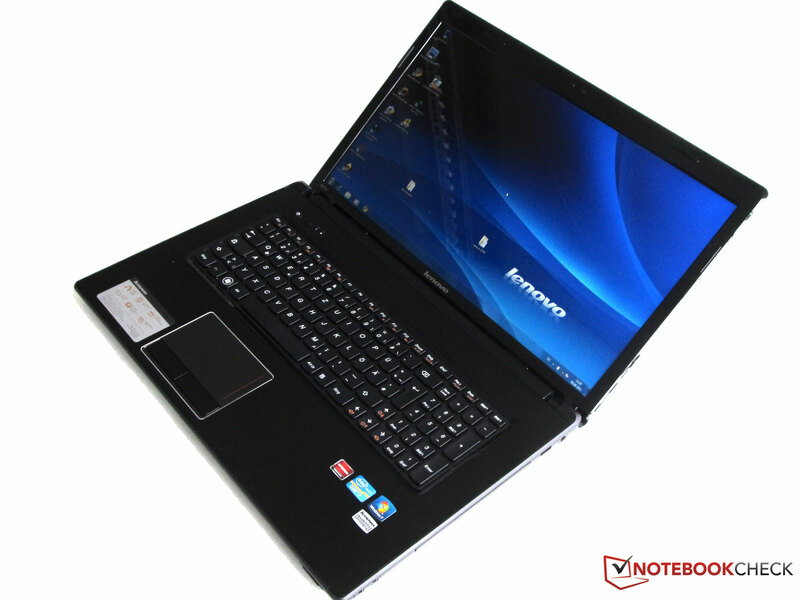 Along with the operating system Windows 7 Home Premium (64-bit with SP1), the following programs are also pre-installed on the Lenovo notebook: Microsoft Office 2010 (60 day trial version), Cyberlink Power2Go, Cyberlink YouCam, McAfee VirusScan Plus 2009 (60 day trial version), ooVoo (video chat software). 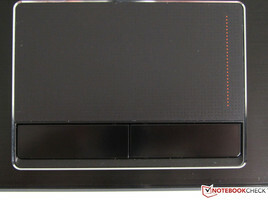 Much more interesting however, are the additional programs from Lenovo which improve the notebook. 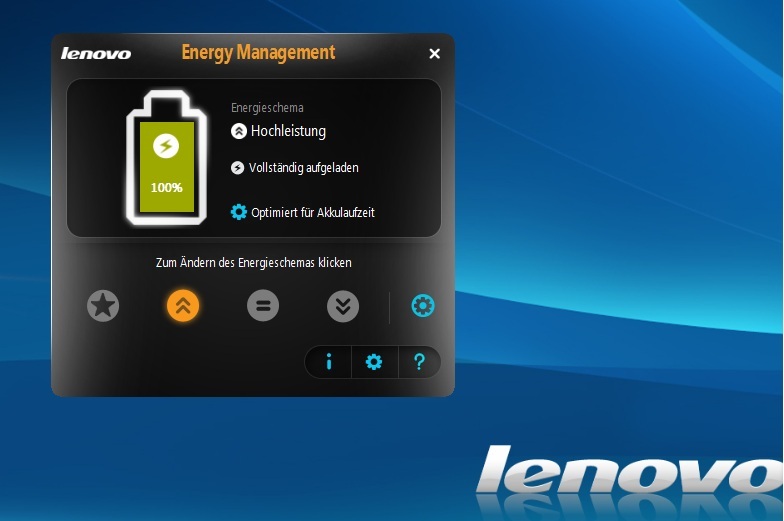 One of these is the power configuration software (Lenovo Energy management), which provides numerous presets and is simpler than the solution provided by Windows. ReadyComm 4.0 is an integrated communications management software, with an intuitive user interface for enabling, managing, and using internet connections. 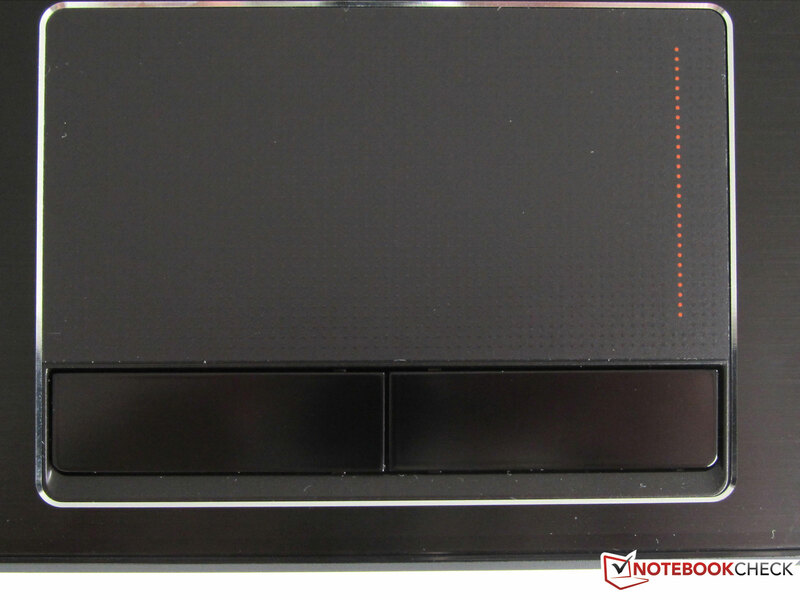 The facial recognition software VeriFace unlocks the notebook when the right users are in front of the display. The facial recognition even worked after a shave and a visit to Sevilla (hair dresser). What is also interesting, is that unregistered users can leave a message via VeriFace, in similar fashion as a digital answering machine. 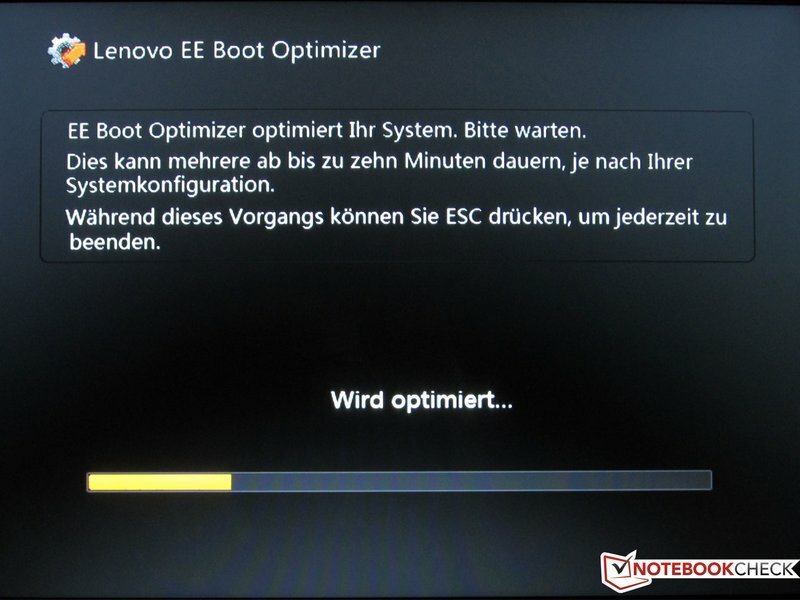 A further program that is put to good use in the G770, is the Lenovo EE Boot Optimizer. With this it is possible to optimize the boot process for Windows 7, making it possible to get to work sooner on the notebook. In addition the shutting down and starting of applications is also accelerated with EE Boot Optimizer. We were able to reduce the boot procedure of our reviewed device from 60 seconds down to 35 seconds. And the starting up from standby was also faster with this tool. The warranty period for this model lasts for 24 months, and includes a Bring-In-Service. This can be extended with a 'Three years Collect & Return' policy for about 150 Euros. The keyboard along with the separate numeric keypad sit firmly, almost as if wedged into the base unit. There is enough room available on either side, that it would have been possible to spread out the keys further. Nevertheless, there is still enough room between the individual keys to allow quick accurate typing. The markings for the Fn key combinations have been less of a success. The orange description of the functions is only recognizable in good lighting conditions, and seeing these in darker surroundings is almost impossible. The addition of a keyboard backlight (such as in the Dell Vostro 3555) would have been one way to alleviate this issue. During the testing we noticed a slight typing noise, which wasn't annoying though. 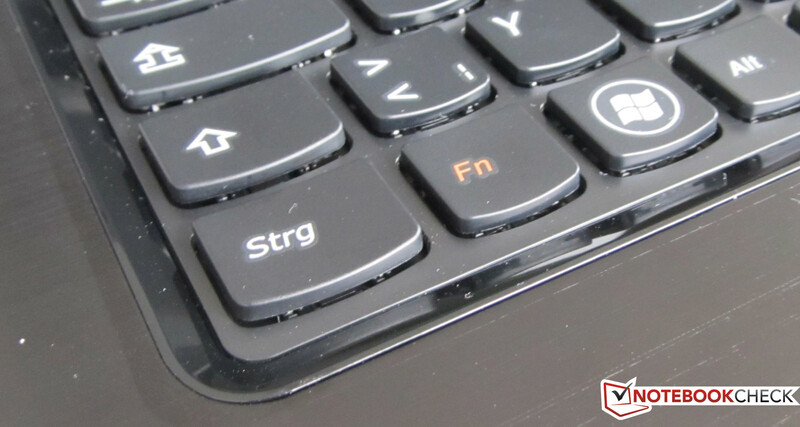 The pressure point of the keys is very good, whereby the slightly curved and concave shape of the keys helps when typing. 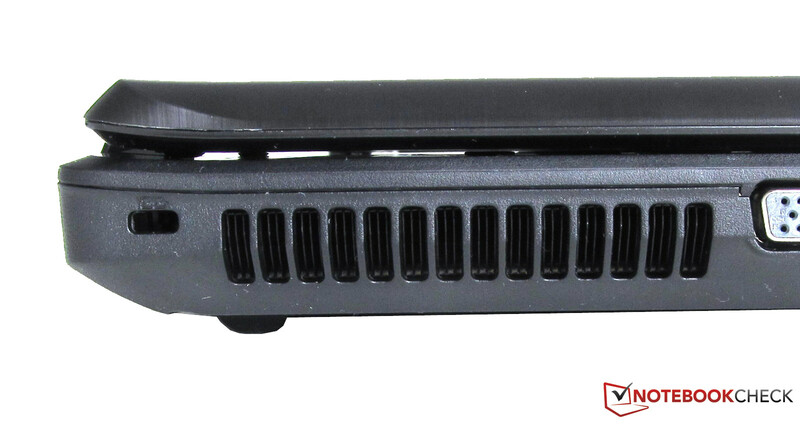 The touchpad in front of the keyboard stands out with several characteristics: Among these is the pleasantly spacious size, the slightly bumpy surface, the scroll area at the edge, and the gesture control. 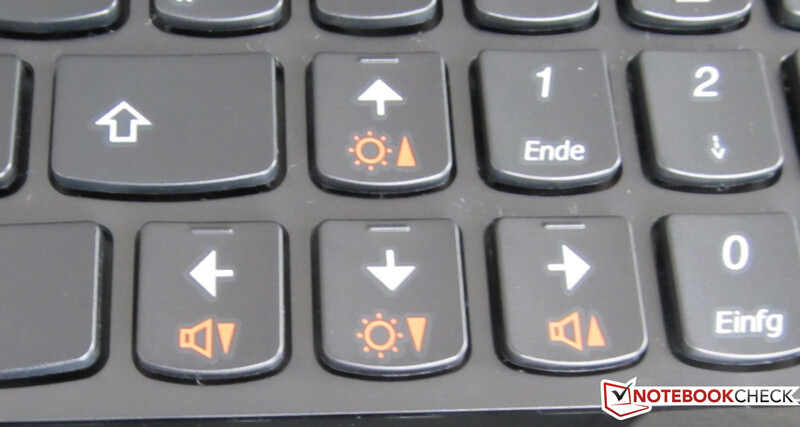 Using the key combination Fn+F6 the touchpad can be deactivated. Unfortunately a relevant status LED is not provided. The 2 megapixel webcam in the middle above the 17.3 inch display can be used to take pictures and record videos, but can also be switched off. The webcam is also used for the VeriFace facial recognition software. Lenovo has equipped the G770 with a 17.3 inch backlit reflective display (43.9 cm). The Samsung panel (173KT01-L01) is able to present a resolution of 1600x900 pixels with an aspect ratio of 16:9. The surface of the display is very glossy, and unfortunately reflects more or less everything in front of it. Reflections of users belonged among everyday occurrences during the review. 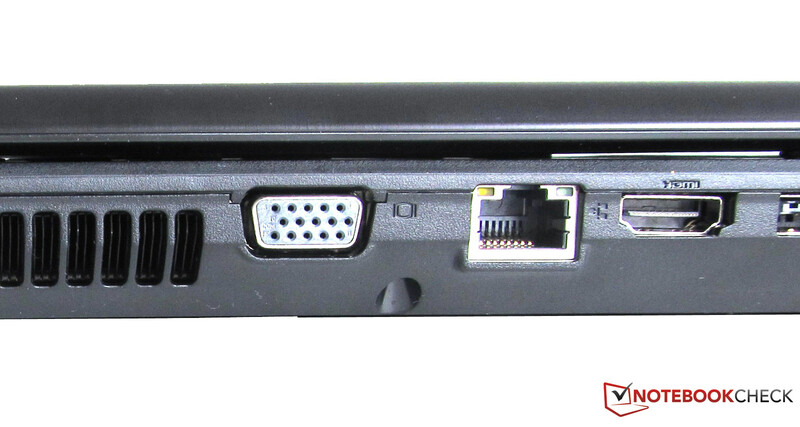 Using the VGA interface or HDMI port on the side of the G770 it is possible to connect additional external monitors/displays. 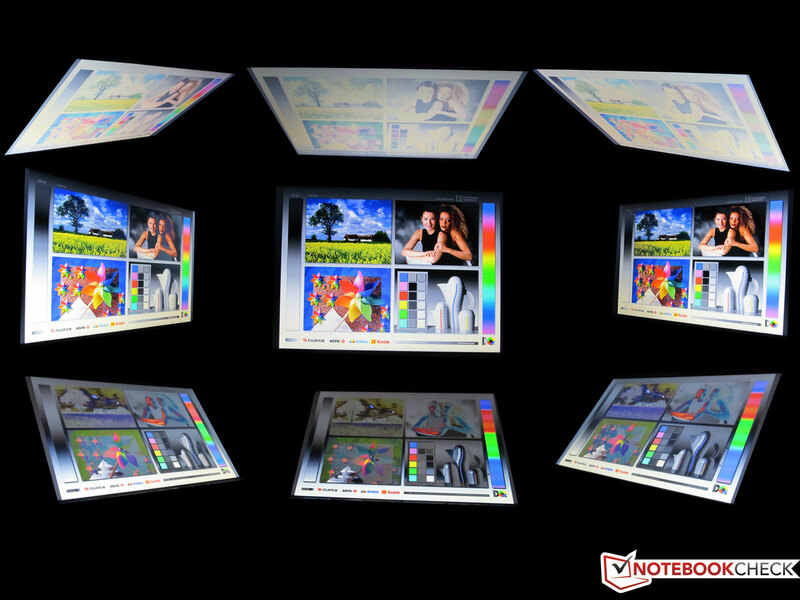 Thus enabling the notebook to be used at the center of a multi-display configuration. The external resolution can be set to up to 2560x1600 pixels. The brightness of the 17 inch display was set to maximum for our 'nine point' measurement. We measured values between 176 and 204 cd/m² (average reading was 187.1 cd/m²). The illumination of the display was at 86 percent. We also determined the black level using the maximum brightness. This was at 1.35 cd/m². 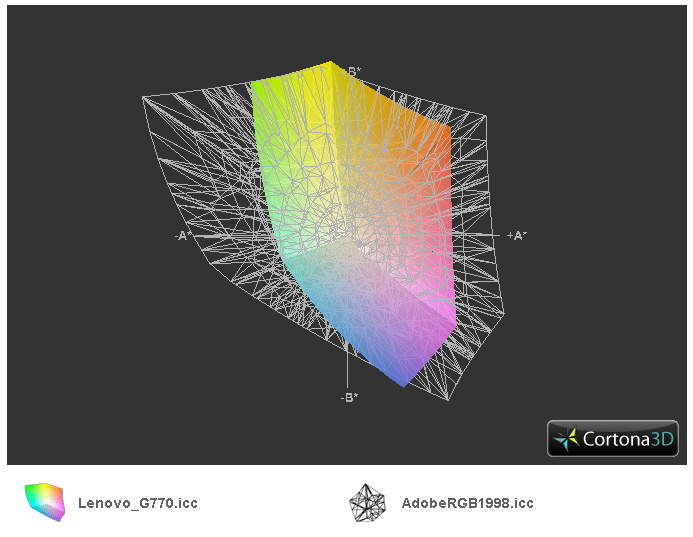 The contrast as a result only has an average ratio of 151:1. The glare type panel improves the perception of colors optically, something that doesn't have a bearing on the measurements though. 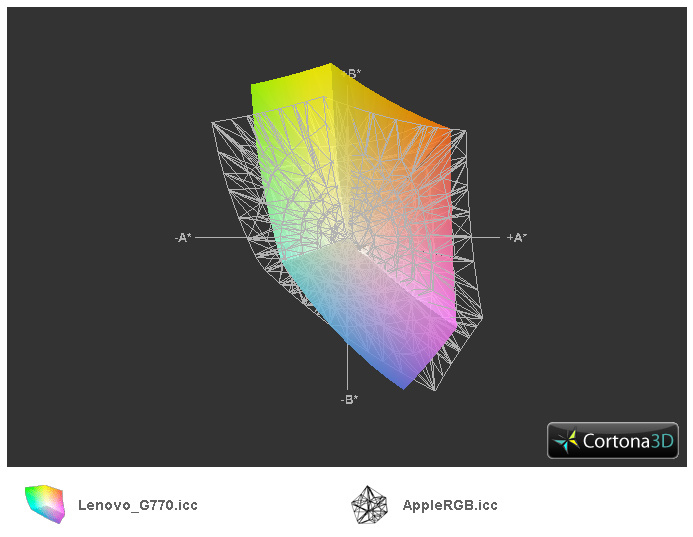 The representable color space doesn't cover the sRGB spectrum, although this is something that should only concern graphics and image editors. During outdoor use the reflections on the very glossy display became distracting during use. Under direct sunlight the displayed images were almost unrecognizable. In the shade we were still able to see the displayed images relatively well. One thing that came to our attention though, is that the glossy display frame reflected a lot of the surrounding garden. The photograph on the right almost makes it look as though we forgot to remove the protective film, which is stuck to the display of many notebooks when they are delivered. This notebooks was delivered without a protective film on the display though. The viewing angles of the display are not especially big with this Lenovo notebook. 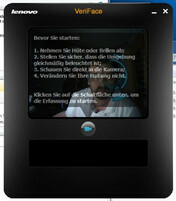 When the display is positioned at a 90 degree angle, the displayed images are easy to see from the front and the sides. The colors presented on the 17 inch display are saturated and have good contrast. If the display is moved up or down, the displayed content becomes inverted. At an angle of +/- 45 degrees the displayed images are practically unrecognizable. We merely had an indication that the content displayed was a test card. The images were too inverted or light in these display positions. The G770 from Lenovo uses an Intel Core i7 2620M with 4 MBytes of level 3 cache. The dual-core processor is based on the Sandy Bridge architecture (32 nm manufacturing process, 624 million transistors on a die size of 149 mm²). 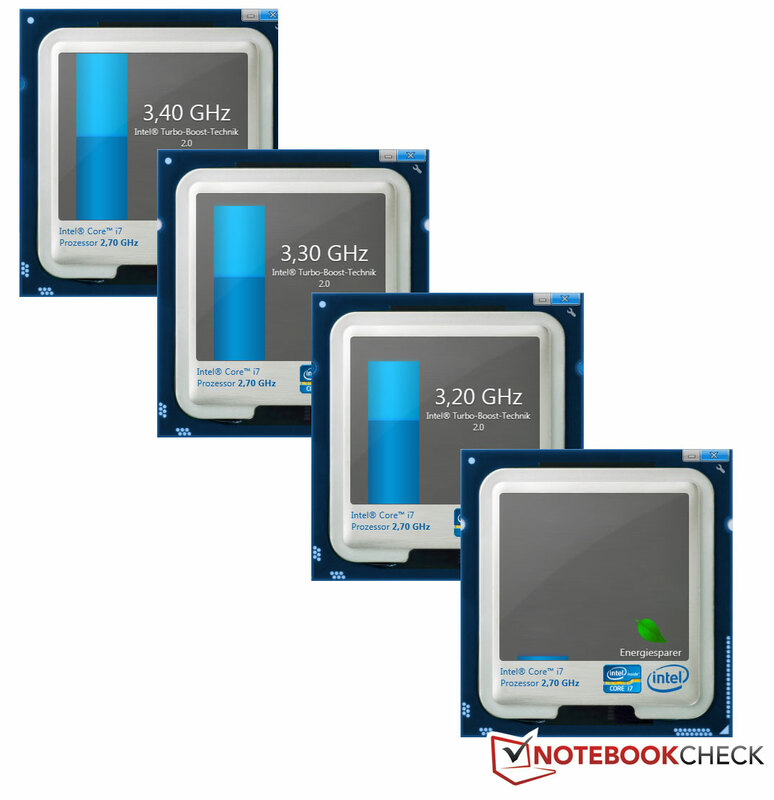 The CPU from Intel can process up to four threads simultaneously thanks to Hyper-Threading. The Core i7 2620M has a base clock speed of 2.7 GHz, and can overclock individual cores up to a speed of 3.4 GHz thanks to the Turbo-Boost technology. The requirement for this is sufficient cooling of the CPU. The higher the temperatures in the core were, the less the Turbo-Boost was used. The dual-core CPU from Intel also has an integrated DirectX 10 capable graphics chip - Intel HD Graphics 3000 - and the memory controller (DDR3-1066/1333 memory controller, maximum 8 GByte). Using the program DPC Latency Checker, we tested for possible problems with latency at the interfaces, as a result of which synchronization errors can occur with external hardware. As the screenshot shows, not all of the measurements were in the green area. We found synchronization errors with this notebook as a result of our measurements (clearly noticeable as red pillars). When red pillars are visible, this indicates possible limitations when transferring data such as audio and video. With Cinebench R10 (single-rendering) in the 64-bit mode, the Lenovo G770 is slightly below the expected performance level of the Core i7 CPU, with a score 5360 points. With multi-rendering (64-bit) using the same benchmark, the Lenovo notebook was able to make up for its previous shortcomings with a score of 11711 points. With Cinebench R11.5 (CPU 64-bit calculation) we were able to determine an above average score of 3.1 points. 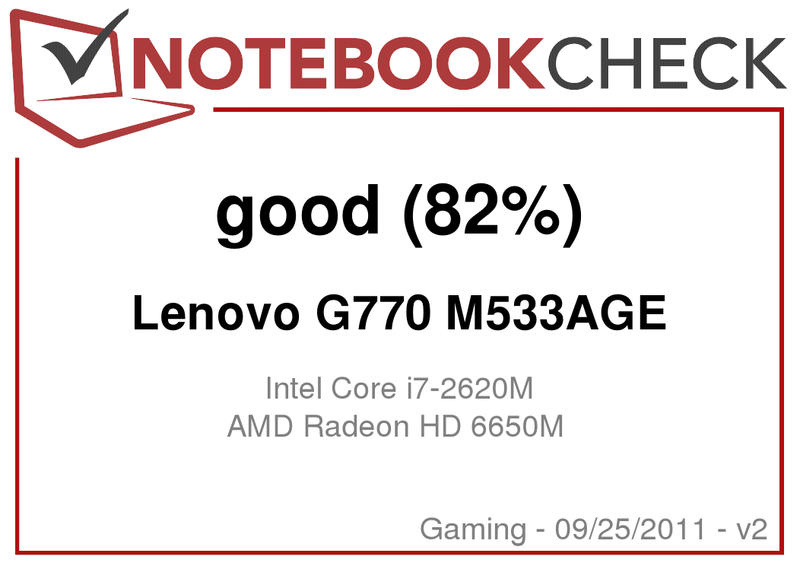 Using the PCMark Vantage benchmark the notebook managed to score 8561 points, putting it in the upper mid-range of results. 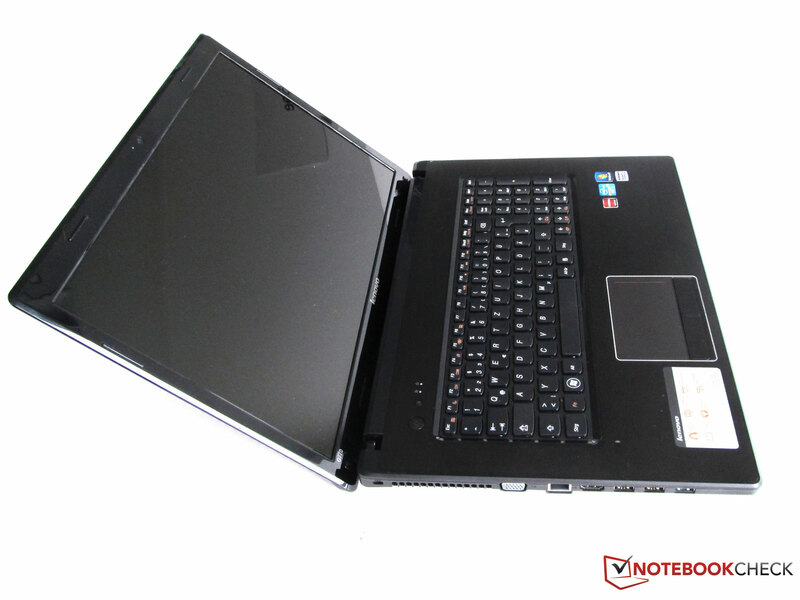 Judging by the points scored, the notebook would fit in between the Nexoc E643 (P: 8363) and the MSI GT780R (P: 8599). Using the newest benchmark tool PCMark 7, the reviewed device achieved a score of 2107. There are two options available for graphics processing with the Lenovo G770: On the one hand the integrated HD Graphics 3000 in the Core i7 CPU, and on the other the dedicated AMD graphics card Radeon HD 6650M. Depending on the application and power consumption (battery powered or not), users are able to decide for themselves which graphics option individual programs should use. 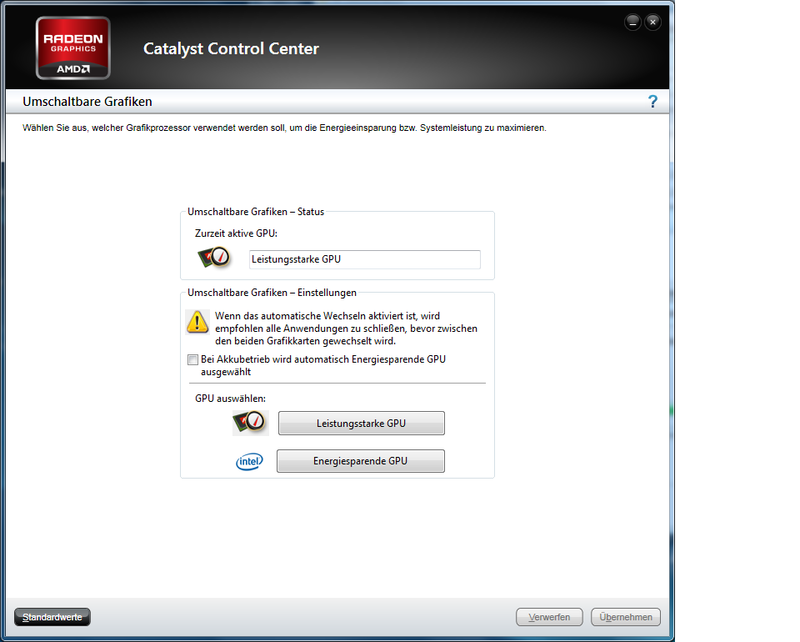 Switching between Intel and AMD graphics options doesn't require restarting the notebook. During battery powered use, users are recommended to use the integrated HD Graphics 3000 in the Core i7 CPU, since the Radeon HD 6650M requires considerably more power. The AMD Radeon HD 6650M is not only faster than the integrated graphics chip, but also supports DirectX 11. In order to compare the two graphics options, we carried out the individual benchmarks in the Futuremark series several times. Once with the HD Graphics 3000, and once with the AMD Radeon HD 6650M: The benchmark 3DMark 06 resulted in 3980 (Intel) vs. 8177 (AMD) points, which shows an improvement of ~105 percent with the AMD graphics card. A comparison using 3DMark 11 wasn't possible, due to the incompatibility with DirectX 11 (Intel graphics). The remaining benchmarks in the Futuremark series are in line with our good expectations, relative to other benchmark results in our benchmark database. We weren't able to notice any negative issues with the Intel Core i7 2620M during our simulated stress test. The clock speed of the processor was initially at around 3.0 GHz, and gradually fluctuated at around 2.7 GHz during the 90 minute stress test. The clock speed didn't fall below the base clock speed of the Core i7 2620M at any point. 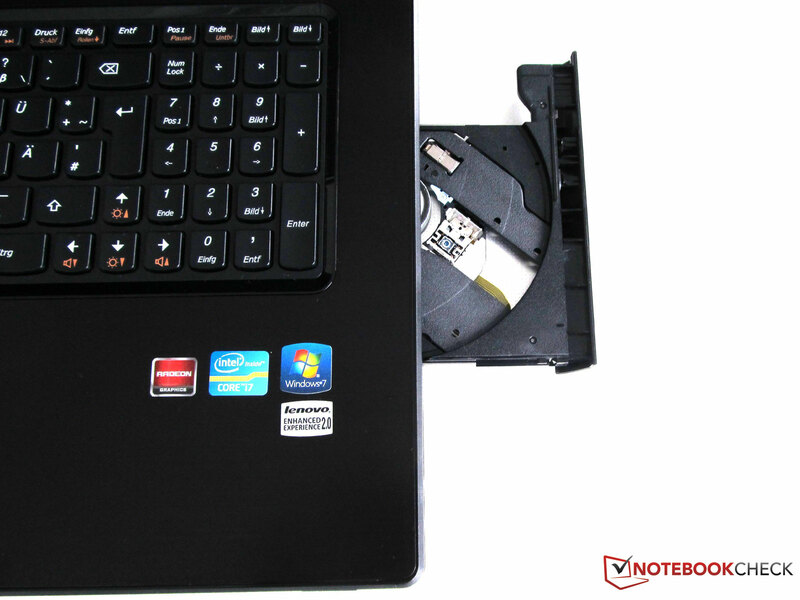 The hard drive integrated into the Lenovo notebook is a 2.5 inch drive from Western Digital. 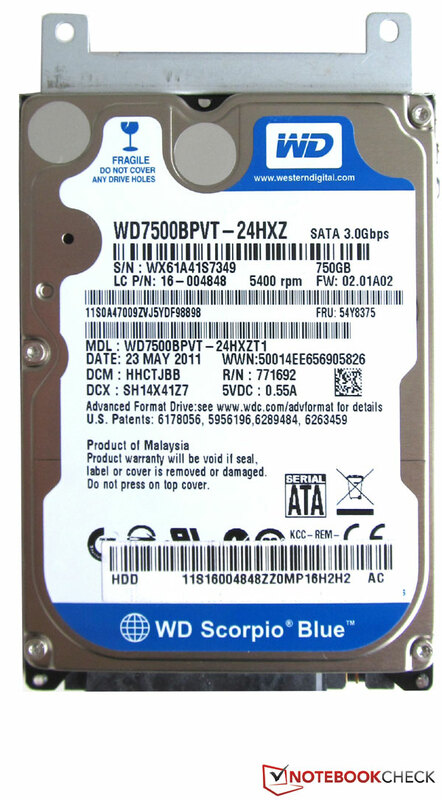 The model WD7500BPVT-24HXZ rotates with 5.400 rpm, and has a storage capacity of 750 GBytes (total). 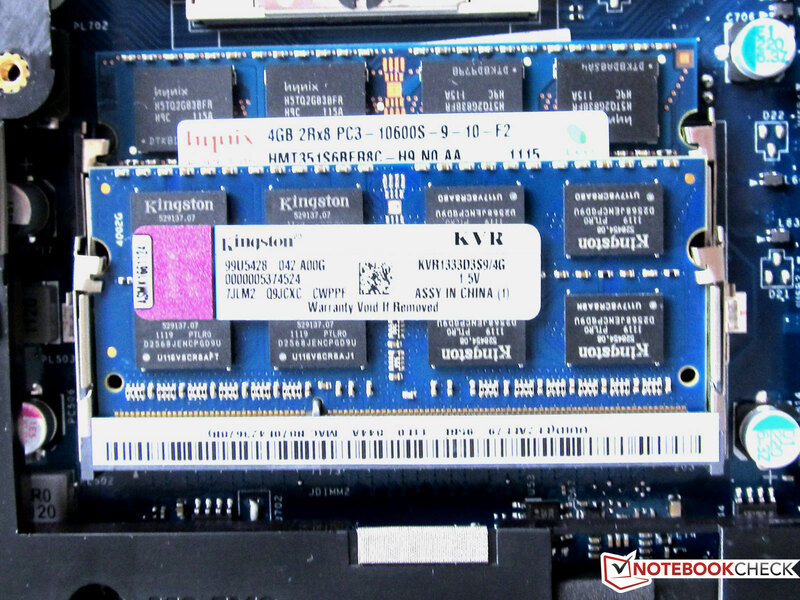 The drive from the Scorpio Blue series has a cache of 8 MBytes, and is connected via SATA-II. The average transfer rate was determined using 'HD Tune Pro', and came to 75.1 MB/s on average. The burst rate measurement determined a value of 115.2 MB/s. Results obtained with the test program 'CrystalDiskMark' were a little higher. Using the integrated HD Graphics 3000 in the Intel CPU, it is only possible to play a few games smoothly during mobile use. The frame rates with graphics intensive games, such as Mafia II, are less than playable (< 9 fps) even with the resolution set to low (800x600). Using the dedicated graphics card (AMD Radeon HD 6650M) the device has noticeably better performance, and even leads to acceptable frame rates with higher resolution settings. If users are willing to compromise, and scale back the details settings or the resolution to 1024x786, then all the games can be played smoothly with good frame rates. Which current games work how well on notebook graphics cards can be discovered in our comprehensive database 'Computer on laptop graphics cards'. Although the cooling fan in the G770 notebook is always active, we weren't able to measure any noise level over 37.6 dB(A). The distance to our measurement device (Voltcraft SL-320) was 15 cm. During the various test scenarios the notebook hardly made itself noticeable in terms of system noise. A sudden burst of cooling fan activity wasn't audible at any point. At an average distance of about 60 cm, the 'humming' was hardly audible. During video playback the cooling fan was only audible during quiet passages of the movie. 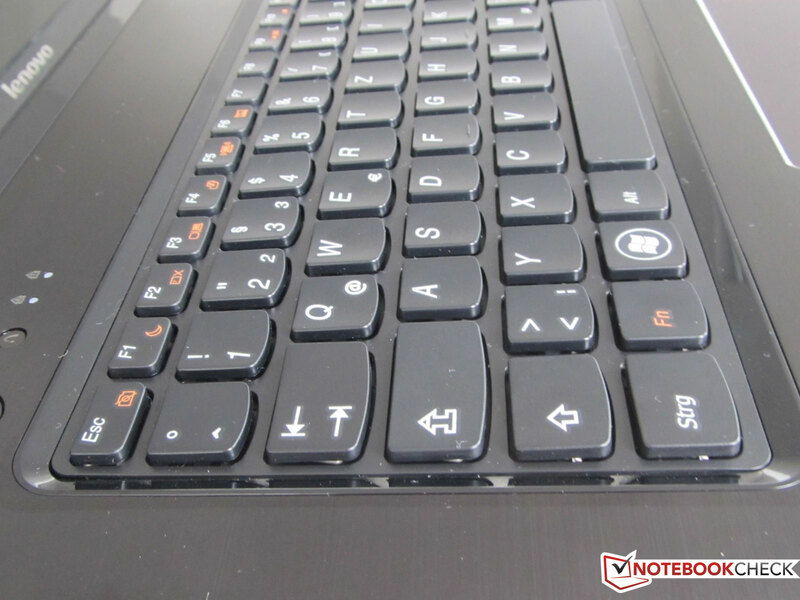 With a high processing load it is primarily the left area of the notebook that increases in temperature, rising to up to 40.6 degrees Celsius. This is also the area where the cooling vents are located, through which the heat from the internal components is transported outwards. On the right side of the notebook the surface remains noticeably cooler, even with a high processing load. We measured about 20 degrees Celsius in this area in an idle state. With a high processing load for the CPU and GPU, the measured temperature in this area only increased by about 4 degrees. The temperatures in the front area of the notebook (palm resting area/touchpad) showed discrepancies of up to 10 degrees. We measured 24.7 degrees in an idle state, versus 33.4 degrees with a high processing load. The AC adapter also had to provide a lot more power during the stress test, and became accordingly warmer. The measured temperatures in this case were 50.3 degrees Celsius, compared to 24.1 degrees Celsius in an idle state. 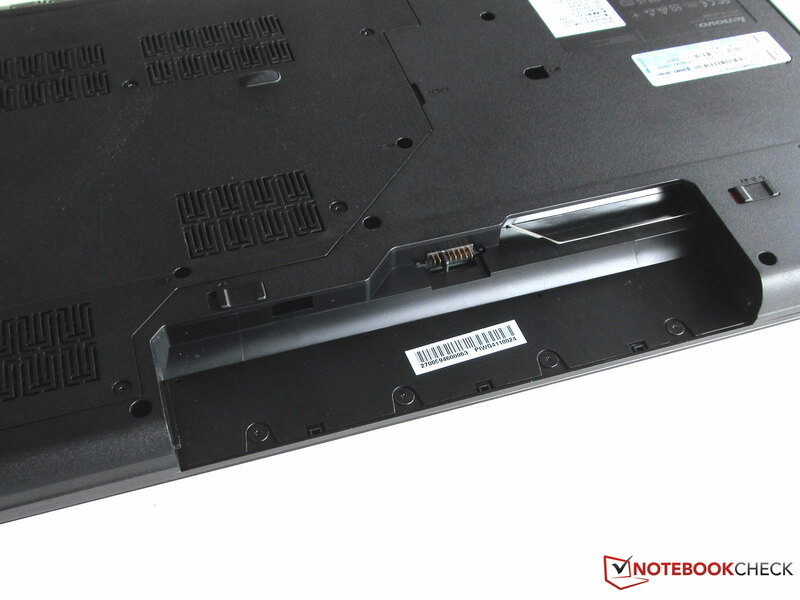 The G770 has two small speakers under the base unit of the notebook for producing audio. The audio quality is unfortunately limited due to a lack of low frequencies. With the volume turned all the way up, you have the impression that the notebook is bouncing up and down, and the audio becomes very distorted. 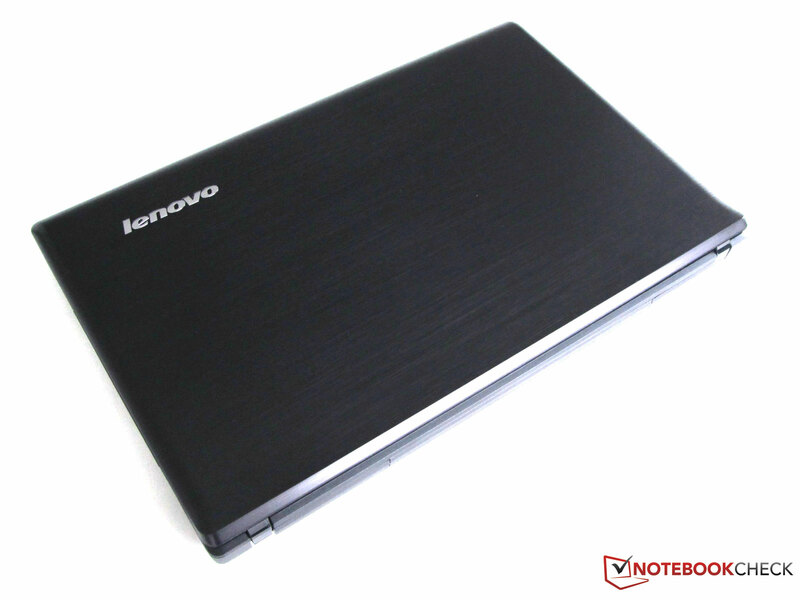 The power consumption of the Lenovo notebook lies at 0.6 Watts in standby mode. When switched off our measurement device showed 0.3 Watts. In an idle state we determined a power consumption of between 8 Watts and 15.9 Watts being drawn from the plug. During the first measurement the display brightness was set to the minimum, the WLAN was switched off, and the power plan was set to power saving. The opposite was the case for the second measurement: Maximum display brightness, power plan set to maximum performance, and WLAN switched on. For the highest possible power consumption (high processing load with maximum brightness, no power saving options, WLAN active) we measured a total of 73.7 Watts. 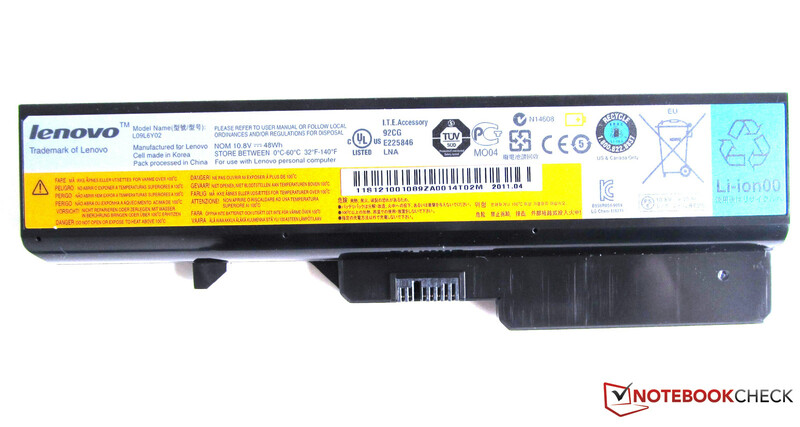 The G770 notebook contains a 6 cell Lithium-Ion battery (LG PABAS024). The first battery life test with the 'Classic Test' from BatteryEater (maximum brightness, WLAN active) resulted in a mere battery life of 57 minutes, even following several iterations. Using the 'Readers Test', with maximum power saving, wireless connectivity disabled, and minimum brightness, the battery lasted for 4 hours and 13 minutes. Surfing using the integrated WLAN: In this case the battery lasted for 2 hours and 50 minutes. During this test the brightness of the display was set so the displayed images were clearly visible. During DVD playback (all power saving features and wireless connectivity deactivated) the battery life lasted for 1 hour and 12 minutes. An empty battery required 97 minutes for a 100 percent recharge. 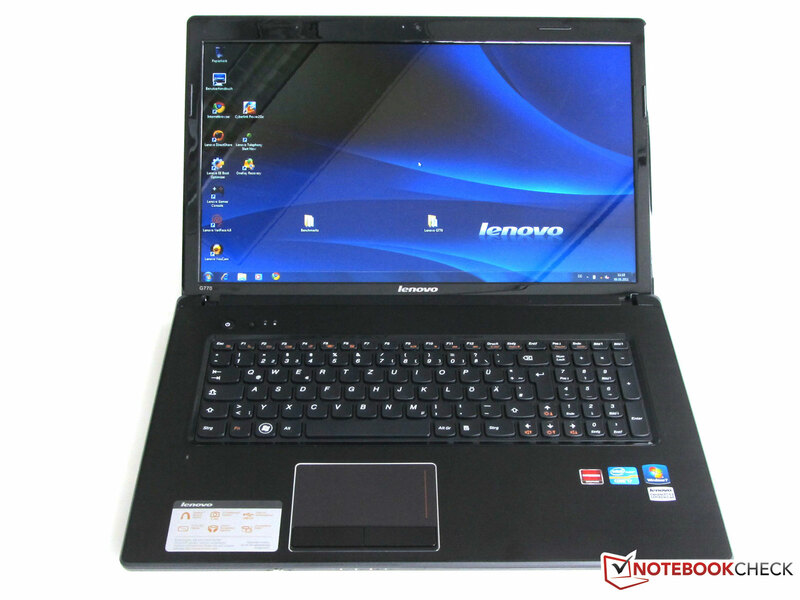 The Lenovo G770 left us with a good impression, although the additional features such as VeriFace and EE Boot Optimizer made the biggest contribution in this respect. 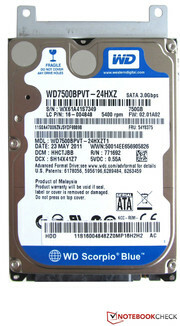 The hardware in the 17.3 inch notebook, which consists of a Core i7 2620M, an AMD Radeon HD 6650M, and 8 GBytes of RAM, as well as a 750 GByte hard drive, round off the whole package. Fast CPU, gaming capable graphics card, and a lot of storage space, what more could you want? When battery powered, the integrated HD Graphics 3000 in the Intel CPU can be used as an alternative to the AMD graphics card, in order to extend the battery life significantly. The comfort provided by Nvidia Optimus for switching GPUs is unfortunately not available. The 17.3 inch display in the G770 wasn't able to impress: Its reflective surface may look good, but only allows for working within limits. Colors and contrast are presented well within the ideal viewing angles, but bright surroundings quickly lead to strong reflections. 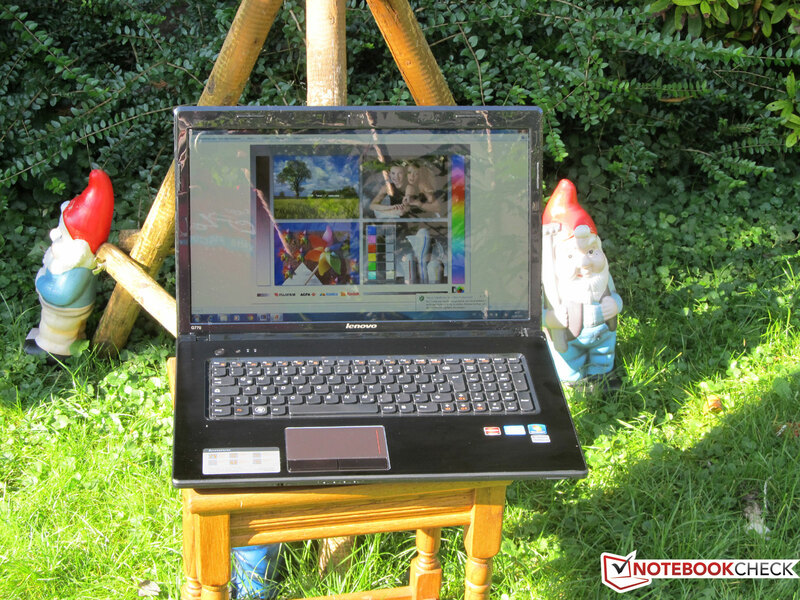 With a total weight of 3 kg, the G770 is not exactly an ideal notebook for outdoor use, but is more suitable as a desktop replacement and work device. In this scenario, the relatively short battery life of about 3 hours makes a lot more sense. 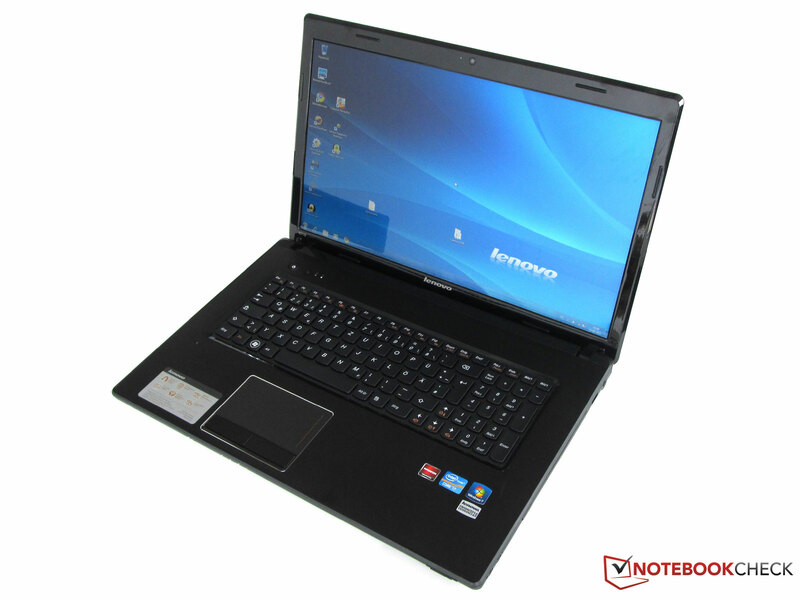 At the present time, the Lenovo G770-M533AGE is available from Cyberport for 799 Euros. 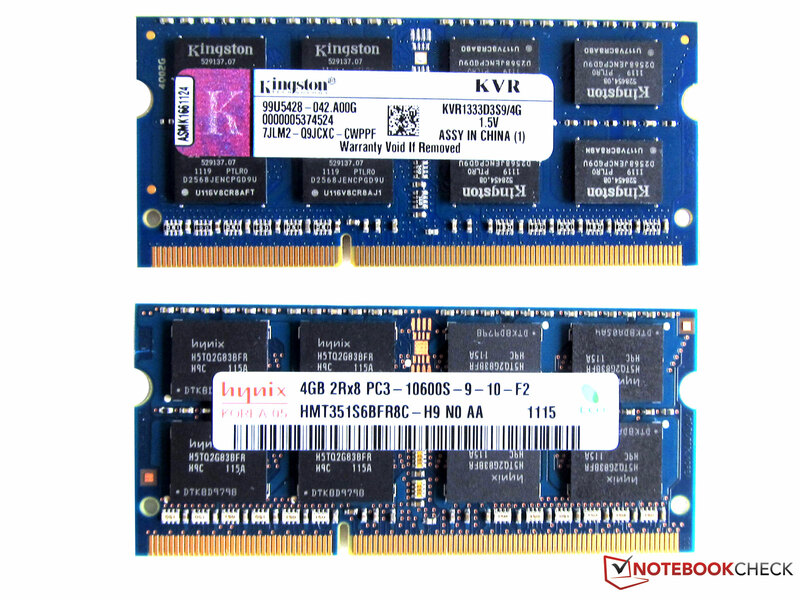 As part of an inclusive offer, the notebook is fitted with 8 GBytes of RAM instead of the standard 4 GBytes. In addition to this a fitting notebook bag is also included by Cyberport for no additional charge. Low system noise and temperatures on the notebook. Better viewing angles for the 17.3 inch display, and a better battery with longer run times, would be welcome improvements for the notebook. The additional software that Lenovo includes with the G770 notebook (EE Boot Optimizer, VeriFace), should be included with all notebooks as standard.